Hyde College on Stockport Road, Gee Cross opened around 1960. It later became part of Tameside College and was closed in the early 2000s. 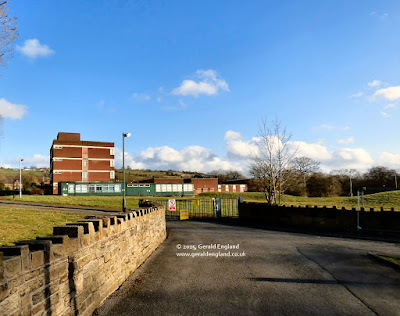 Having been in mothballs for many years the site is now being sold in order to help fund a super college in Ashton-under-Lyne and despite being on Green Belt land a planning application has been made for an estate of 40 houses to be built on the site. See another photograph of the site on Hyde Daily Photo. A contribution to Scenic Weekends. A sad demise for this lovely property. Love those walls along the driveway. Nice to see that you keep on going. I have followed you for so long that I'll trot after, although I have of course visited this blog before.